Review Fix chats with “The Creep” writer John Arcudi, who discusses the inspiration behind the series and the possibility of it continuing. In terms of comic books, “The Creep” is a masterpiece, a tale of noir crafted around a mysterious series of suicides and a man who must solve the case before he can find closure for a lost love. In terms of literacy presence, “The Creep” is a prime example of how some comic books can transcend the genre. No super heroes. Not even a super man. Oxel is just a man. This is just a story. But it’s enough to make you a fan of the medium for life. Review Fix: What was the inspiration for “The Creep”? John Arcudi: That’s kind of a two part question. As to the character of the Creep (which is to say, Oxel Karnhus) I’ve always liked police stories, private investigator stories, that sort of thing, but I didn’t want to just do another mystery series because really, others do that better than I can. I wanted to try and work with a character who wasn’t the usual alcohol-soaked loser. I wanted to handle a character who isn’t so much haunted as he is injured. Since I’m a big fan of the work of the character actor, Rondo Hatton, I suddenly found my guy, you know? Acromegaly is also such a visual illness, and that’s perfect of comics, but the trick is always making sure you’re not so much exploiting the illness as exploring it. I hope we succeeded there. This particular story’s inspiration… boy, I don’t know. It’s been in my head for so long now, I really am not sure where it started. Review Fix: What was the writing process like? Did the story come out easy or did it take some prodding? Arcudi: The basic plot has been in my head for years, but the funny thing about it was that as I started to sit down and write the actual scripts, things started to change. I made a lot of character decisions that surprised me a little, so while I wouldn’t exactly call it a difficult process, it was very much a work in progress almost to the end. Review Fix: Why do you think readers connect so much with Oxel? Arcudi: If they do, I guess it’s because he’s a decent guy. Not a badass, which you always see in such storyline, but a good guy just struggling to do the right thing. Readers may like badasses, but they don’t really connect with them. Or anyway, I don’t. Review Fix: What was it like working with Jonathan Case? Arcudi: Great. Jonathan was a pleasure to work with. Very hard worker, determined to get things right no matter how many “takes” we asked him to draw — but it shows in his work. He gave Oxel a humanity that I think a lot of other artists would never have been able to achieve. Review Fix: What did you read as a kid? How do you think it influenced you as a writer? Arcudi: I read a lot of science fiction as a kid — big surprise, right? But I don’t think that influenced me too much. The stuff I started reading in my 20s — Charles WIlleford in particular — that made me look at my writing… well, at writing in general, very differently. Review Fix: How did the idea to get different artists to do covers come about? 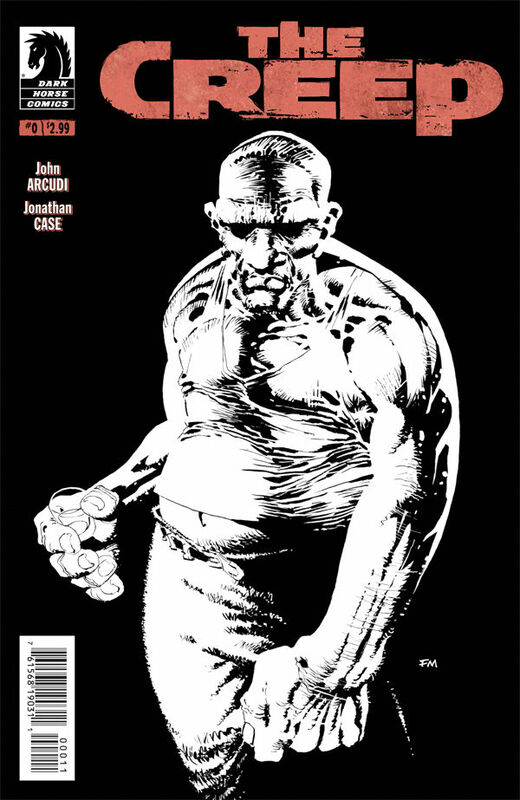 Arcudi: We already had Frank Miller’s cover from a “Creep” story we did back in the first avatar of Dark Horse Presents some years ago and I want to re-use it for issue #0 (which reprinted the three part Creep story from the new DHP published last year). Frank gave us his permission and then we thought “Why not a series of guest cover artists?” You know, to catch readers’ eyes, and to match up with the likes of Frank. So I made a list of my dream cover artists and they all said yes! We actually had planned to use a guest cover artist for #5 as well, but Scott and I agreed that Jonathan really should get that slot. Review Fix: Have you discussed the story with Frank Miller? If so, what does he think about it? Arcudi: Well, the Frank Miller cover was from a long time ago, so we never discussed this particular storyline. I was just glad that we got to use it again and let a new audience see a great cover that many fans may have missed the first time around because Frank (not surprisingly) killed it. Review Fix: Any chances at another Oxel adventure? Review Fix: How do you want this story to be remembered? Arcudi: Who wants it to be remembered? I want folks to reread it instead.